The Armory Show and Gertrude Stein are inextricably interconnected. Stein’s emerging reputation was used to promote the show, and the show in turn helped turn the notoriously inaccessible writer into an icon. Stein belonged to an important family of Paris-based art collectors, which included her brothers Leo and Michael Stein, and Michael’s wife Sarah. The Steins lent a number of paintings for display, including works by Picasso and Matisse. 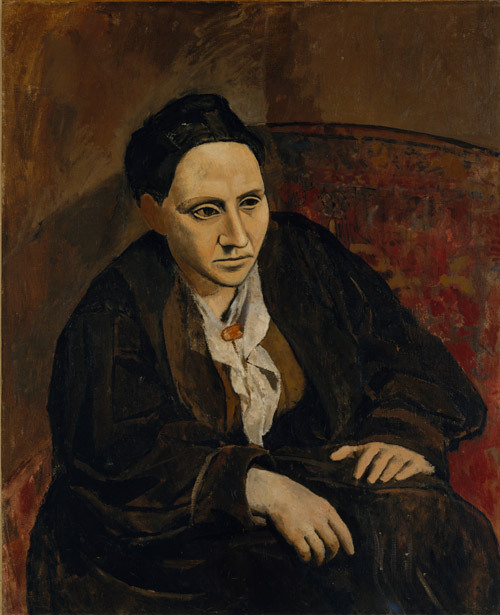 Stein herself was the subject of a famous portrait by Picasso, and her own prose “portraits” blurred the boundaries between literary and visual art. Stein’s art-filled Paris home, which she shared with Alice B. Toklas, became a crucial stopping off place for anyone interested in the newest trends in modern art and literature. Among Stein’s many bohemian admirers and patrons was the American heiress Mabel Dodge, about whom Stein composed “Portrait of Mabel Dodge at the Villa Curonia.” Obviously flattered to be the subject of this prose portrait, Dodge had three hundred copies of the work printed up and handsomely bound distribute among her friends in New York’s avant-garde circles. It was this volume that brought Dodge to the attention of Frederick J. Gregg, who in turn enlisted Dodge to write an article about Stein for the Armory Show issue of Arts and Decoration. Dodge’s article, printed alongside the text of “Portrait of Mabel Dodge,” proposed that “Gertrude Stein is doing with words what Picasso is doing with paint.” Foreshadowing the emerging importance of advertising and public relations to the arts and letters of the twentieth century, Dodge helped create an enduring link between Stein’s writing, cubism, the Armory Show, and herself, as a modernist muse. Janet Bishop, Cécile Debray, and Rebecca Rabinow, eds. The Steins Collect: Matisse, Picasso, and the Parisian Avant-Garde (New Haven, CT: Yale University Press, 2011).